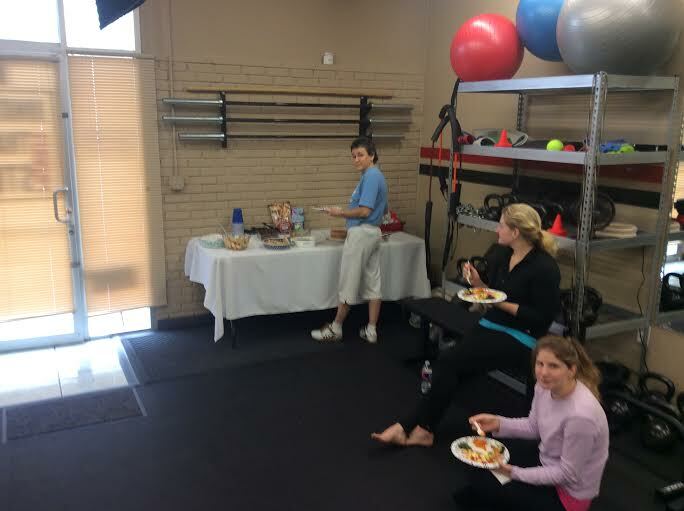 The 21 Day Paleo Challenge Class/Potluck Pics and Winner! The class and potluck went amazing Saturday. We had an awesome spread of grilled chicken, grilled grassfed beef burgers (no buns of course), mashed sweet potatoes, spinach souffle, fruit, guacamole, and other awesome Paleo treats. As you know, you were asked to e-mail/post pictures of recipes or Paleo dishes you were eating. This entered you into a drawing for four FREE saturday classes and a Jonathan’s Private Training Studio T-Shirt. You also entered if you came to the class/potluck, so if you did both you were entered twice. The winner of the 21 Day Paleo Challenge was Kim! She posted a ton of pics and recipes so congrats Kim! Moving forward, classes will still take place every Satuday at 10 am. However, class will not take place if less than THREE people commit to coming to class 24 hours in advance. You can let me know via email, phone, or social media. Thanks to everybody to who participated and came out Saturday. Keep going Paleo! This three weeks was a great start, now keep doing it and turn it into something that is apart of your daily life. That is the only way lasting change can occur.